The naming of David Nussbaum as CEO made the future of Chris Kimball (pictured) at “America’s Test Kitchen” unclear. 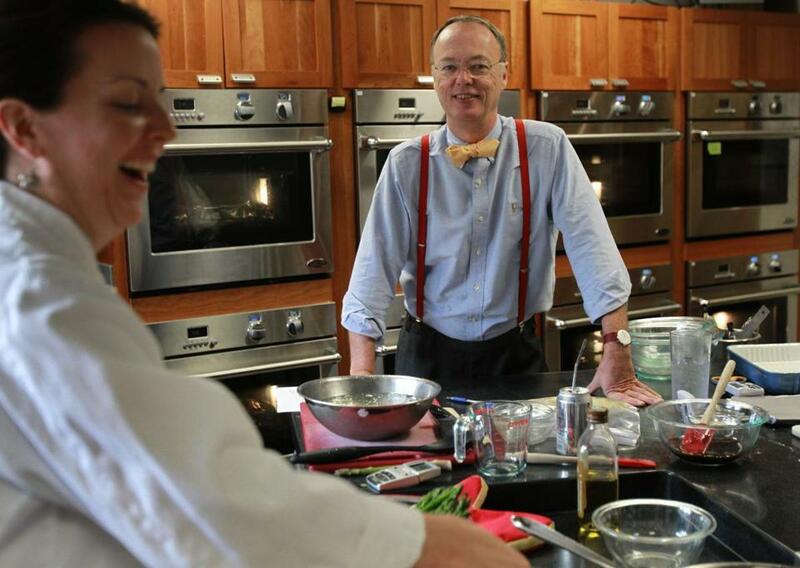 Christopher Kimball is the face of Cook’s Illustrated and its television cousin “America’s Test Kitchen,” an entrepreneur who began building a culinary media empire long before “Top Chef” or “Chopped” dominated the food scene. But in a move that raises questions about his future, parent company Boston Common Press LP has brought in a seasoned executive to run the organization. David Nussbaum was named Monday to the newly created post of chief executive of the Brookline-based company, which also produces Cook’s Country magazine, cookbooks, radio shows and websites, and runs an online cooking school. He was also named chairman of the board. Nussbaum was previously the top executive at content and e-commerce company F+W Media Inc., and before that CEO of Penton Media. Private equity firm ABRY Partners in the past held stakes in both companies. As part of the changes announced Monday, Boston Common Press added ABRY’s cofounder and a former ABRY partner to its board. While Kimball remains president of “America’s Test Kitchen,” his future role isn’t clear. “The board is currently in discussions with Chris and he continues to handle key responsibilities, including hosting ‘America’s Test Kitchen,’ ‘Cook’s Country,’ and our radio programs,” read an e-mail circulated to the staff. People close to the company say Kimball remains an owner. But it was unclear how the ownership structure of the privately held company may have changed and whether Kimball will be reporting to Nussbaum, who takes over Oct. 14. Kimball was filming a television show and could not be reached for comment. At Penton, Nussbaum gained something of a reputation as a cost cutter. (A 2008 Folio story referred to him as a “fixer” for ABRY Partners, a term with which Nussbaum takes issue.) Bishop said Nussbaum will concentrate on new opportunities mostly in the digital space. “He’s not coming in to revamp the magazines,” Bishop said. For instance, he said, that could include new shows targeting different demographics, possibly delivered via new platforms. He sees online education as an area of opportunity. The website is being redesigned and relaunched, with more emphasis on social components and a better search function for recipes, among other things. Boston Common Press does not disclose sales or profits, but Nussbaum said it is growing each year. A Globe story in 2009 put rough estimates of gross revenue for print and Web subscriptions alone at more than $40 million a year. Kimball, 64, is the well-known personality of Cook’s Illustrated — his bespectacled, bow-tied countenance is pictured in a black-and-white illustration set into the editorial that kicks off each issue. (It appears he will continue to write these for the foreseeable future.) The magazine, which he founded in 1992, has a circulation of about 950,000, including subscribers and newsstand sales; the circulation of Cook’s Country is about 350,000. “America’s Test Kitchen” has been in tumult in recent weeks, with rumors flying after a staff meeting and an earlier e-mail regarding coming changes. That e-mail, sources close to the company said, indicated Kimball might depart with wife, Melissa Baldino, an executive producer there, to form a new company. Joining Nussbaum on the company’s board are Royce Yudkoff, cofounder of ABRY Partners, and Peni Garber, a former partner at ABRY. Yudkoff, a professor of management practice at Harvard Business School, is a former partner at Bain & Co., where he worked with Boston Common Press partners George P. Denny III and John D. Halpern. Devra First can be reached at devra.first@globe.com. Beth Healy can be reached at beth.healy@globe.com.